• 2.4GHz wireless surveillance system with PLL circuit design. • 4 channel selection to avoid interference. • 6 IR LEDs provide bright view for darkness. 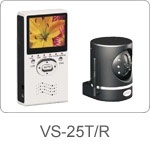 • 1/3" color CMOS image sensor 64° fixed wide-angle lens. • 380 TV lines clear picture display. • 2.5" LCD screen display for vivid and bright images. • Channel scan and skip for multi-camera usage. • Remote Pan & Tilt control automatically or manually Pan: ±90°;Tilt: ±30°. • Small palm size of receiver for mobile usage.